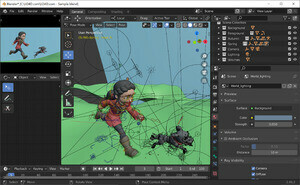 Blender is a freeware and open source 3D image editor which works with modeling, image animation and rendering of 3D graphics formats inside of a clean, customizable interface. With this very well-done editor, users have access to a wide range of powerful editing tools for creating objects, sculpting and painting objects with various types of textures. This program is highly capable of creating complex 3D scenes. In the game mode, graphics publishers and game creators are given access to useful tools. Version 2.79b is a freeware program which does not have restrictions and it's free so it doesn't cost anything. For security reasons, you should also check out the Blender download at LO4D.com which includes virus and malware tests. Additional screenshots of this application download may be available, too. Blender has a presence on social networks. Blender download been highly rated by our users.